In researching pickled fish manufacturers, I found the mission statement of one Scandinavian company to be the most concise and oddly original. "Most people like eating seafood and are keen to do so more often. That’s where we come in" That's from Abba, (the seafood purveyor, not the band) who make everything from pickled herring and caviar to prawns in brine and tinned mackerel. It's true; seafood is great but it's highly perishable and not well-suited to eating on the go. But what if you preserved it? So the Scandinavians started pickling the fish and smoking the roe. To make the rich-tasting roe easier to eat, it was often made into a paste and served like pate. But what if you only wanted a little bit at a time? 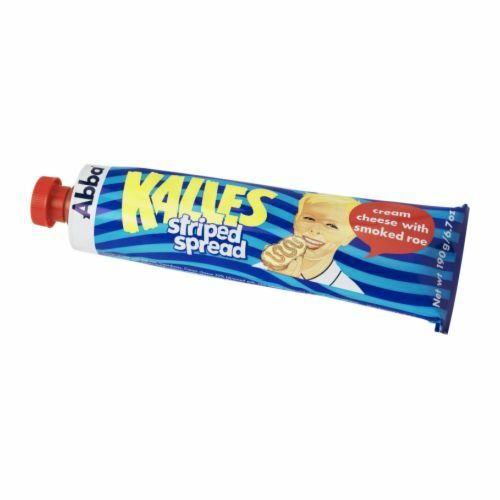 Why, put it in a tube and dispense it fresh like toothpaste! I just think this is so cool, albeit strange as an outsider looking in. It makes perfect sense, since the metal tube with keep the smoked cod roe fresh. You only squirt out what you plan to eat at that moment, preventing the insides from being exposed to the air. Then you can eat it as a sandwich filling, mix into deviled eggs, or top canapes and crackers. But what makes this so fascinating to me are the nuances of the packaging. 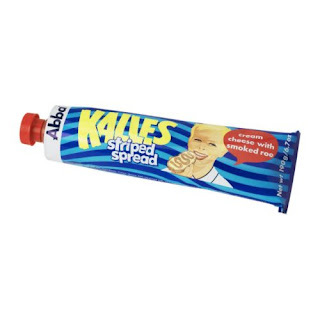 Many manufacturers (and lots of companies in Scandinavia make a product like this) have a star-shaped nozzle to make it easy to create decorative patters in smoked fish paste. Others mix in dill for added flavoring and green-flecks of distinction. But the best is yet to come. If you like your Aquafresh toothpaste, with its layers of white, green, and red paste, you'll love the cod roe dispenser tubes that squirt out pink cod pate lined with layers of cream cheeses. And it still has the star-shaped extruder tip!